Ah, that old book smell. The smell of a book that has been gathering dust for decades. Dust in little balls across the top of pages. You scrape it off before you open the book, hearing the binding crack as you do…wondering if you are making a mistake waking this old book from its sleep…hoping the pages won’t crumble as you turn them. This book is not one of those in part because it has been preserved chemically. Do you remember the smell of mimeograph paper? Libraries tend to use some sort of disinfectant or bug spray or something that smells like a mix of mimeograph and moth balls. Our friends at Frinton-On-Sea apparently love the stuff. I get a strong whiff with every turn of the page. Maybe a headache too. I would love to invite you to read this book with me but it’s a little hard to find. There are a few online libraries that offer it or you can find it on several online retailers. It isn’t cheap. I’m too embarrassed to remember what I paid for my copy but at the beginning of January, 2016 there is one on Amazon for $114. In a way, I’m reviewing this for you to save you from a $114 mistake. On the other hand, I really don’t do book reviews. I share with you as books change me. Both of Mr. Henderson’s prior works are still working on me and I have high hopes for this book as well. This book may contain one idea that is well worth $114. If so, it is money well spent. I will try and explain the bare mechanics of the process [of farming]. Not in the sense of mechanized farming, but of the human machine on the land and its application to work. Three generations of Jordan spent four hours shoveling manure prior to a heavy rainstorm at Christmas. Dad drove the loader tractor. I worked, directed and instructed as the children helped. Henderson laments in the preface that he sees young men driving the tractor while old men are doing the heavier work. So far so good. But then he lays it all out. Management also is passing into the hands of college-trained men who have no manual skill with which to instruct those who serve under them, and to inspire them with a joy in work which makes hours, wages and conditions of secondary importance to the pleasure and interest which may be found in the work. The pleasure of shoveling manure. Yes, pleasure. I know exactly what he is talking about. Nobody wants to shovel manure for the sake of shoveling manure. When was the last time you jumped for joy that you could clean a litter box? But I want to keep livestock. I enjoy our livestock. And this is the price. I want happy, healthy, clean, dry livestock. This is the price. I shovel manure and bedding. I try to find efficient and effective ways to accomplish this work but I also try to just stand there in the barn and enjoy the cattle. I don’t look forward to completing the work. I look forward to having healthy livestock. See the difference? The tragedy of it all is that given the skill, and the high output which comes from skill, agriculture is the happiest and pleasantest of all occupations, performed under conditions of fresh air and sunshine, and with proper direction and efficiency it should be possible to find in it a reward comparable with anything which can be earned in industry. Well, now, Mr. Henderson. Things may have changed. Generally, I agree with what you are saying…hence the farm. But not entirely. I am in little danger of losing a limb at the office. There is little chance that an agitated co-worker will crush me at my desk as I sit in a squishy chair and air conditioning. But I have less chance of catching a communicable disease on the farm than I do in the office, a point you made earlier in the preface. There are no free lunches. But I do agree, generally, that farm work is pleasant and fulfilling. Database optimization is less so. 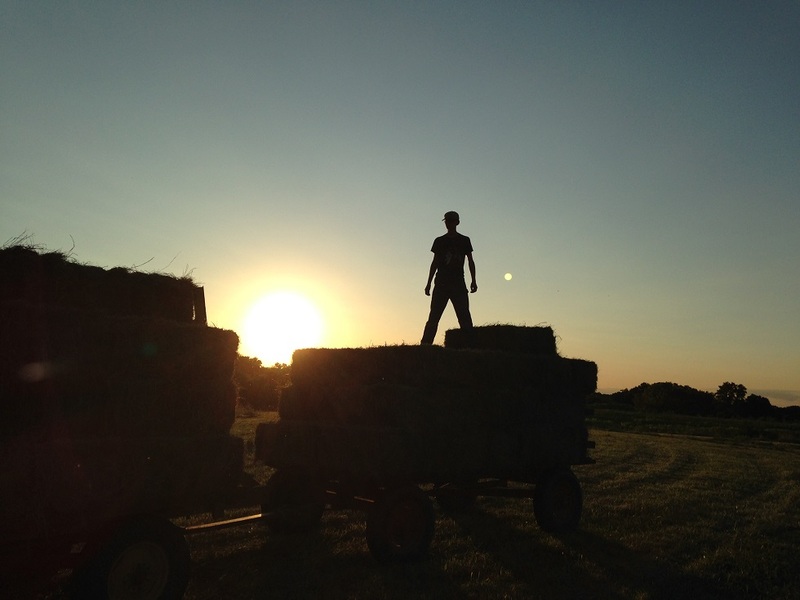 Farm work is something to be enjoyed…because it is creative. There is so much scope for initiative, pride and interest that we…never give up or think of retiring. I agree. So does Gene Logsdon as he wrote in The Mother of All Arts. But I can say that of all of the jobs I have had since I left food service behind in my youth. Construction? Creative. Training? Creative. Server administration? Totally creative. And that’s a big part of what draws me into each of those and away from changing tires on tractor-trailers. I don’t do well with mundane and routine. I would die on an assembly line. Heck, I have a farm and a job that both leverage my creativity and still I blog as a creative outlet. But he finishes the above paragraph by pointing out that it is soothing to perform farm tasks we have mastered when our soul is troubled. And I agree. Julie and I have been through some stuff this fall. There is something entirely therapeutic about getting up early and doing chores. Hello chickens. Hello pigs. Hello cows. Check water, check feed. Count heads. Look at eyes, ears and noses. That part is the same every day and those simple actions pulled us through some hard times. Though I enjoy my job in town I found the servers I work with to be unsympathetic and uninspiring on our bad days. Julie’s right shoulder is always sore. Is she carrying a bucket incorrectly? Probably. A bale of hay? A sack of feed? Is this an issue of technique or just a lack of strength and conditioning? Maybe both. But I hope we gain some insights into how to address the issue by reading this book. I don’t mind rubbing my wife’s shoulders but I do mind a lifestyle that is damaging to her body. And that is exactly the problem this book sets out to solve. I hope you can find a way to read and discuss it with me. I’ll do my best to make it meaningful in case you can’t find a copy. ← What Does 2016 Look Like? Kind of like yet another Star Wars movie, even if there are flaws it will be worth it, just because it’s Henderson. And his perspective has changed quite naturally – he’s an older man now, with a generation of experience under his belt, and the world around him has changed substantially as well. He’s about to teach nuts and bolts of farming to young people who are growing up with machinery and burgeoning technology, for whom high school education is now mandatory, and for whom college is a realistic possibilty. They’re not the audience he’s accustomed to, and frankly neither are we, half a century on. I’m looking forward to seeing it through your eyes.